A healthy snack dipped in rich milk chocolate…what is not to love about that? 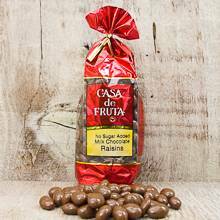 Try our plump, chewy raisins covered in sugar free milk chocolate today and find out why these are one of the most popular chocolate covered items we have. Packaged in an 8 oz. bag.